Avon offers you the first autumn catalogue of 2012. And you have the chance to look at the catalogue through our website. In the previous catalogue there were really satisfactory discounts thanks to religious festival. After the big discounts which were made last month now you may think that the prices will be higher this month. However, those who have looked at this month’s catalogue will realize that this thought is wrong. 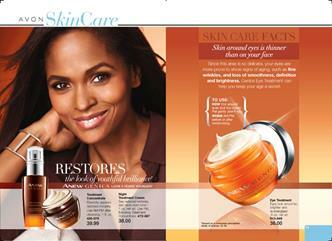 What is the content of Avon September Catalogue 2012? First of all, we should remind you that this is an autumn Avon Catalogue. Skin protectors special for summer, sun creams and summer accessories lose their importance. As you know, autumn is the season that tells us summer has gone away. In this season, people feel deeper the signs of ageing by looking at their faces and bodies. Naturally, they need to take precautions against these problems. At this point, anti-aging products which were produced by Avon help people who have these problems. In addition to these, special perfumes for the autumn season take part in the catalogue. Avon perfumes are at discount this month and these perfumes provide the highest customer satisfaction. You can find other details in the catalogue. The catalogue has been available since 31 August.